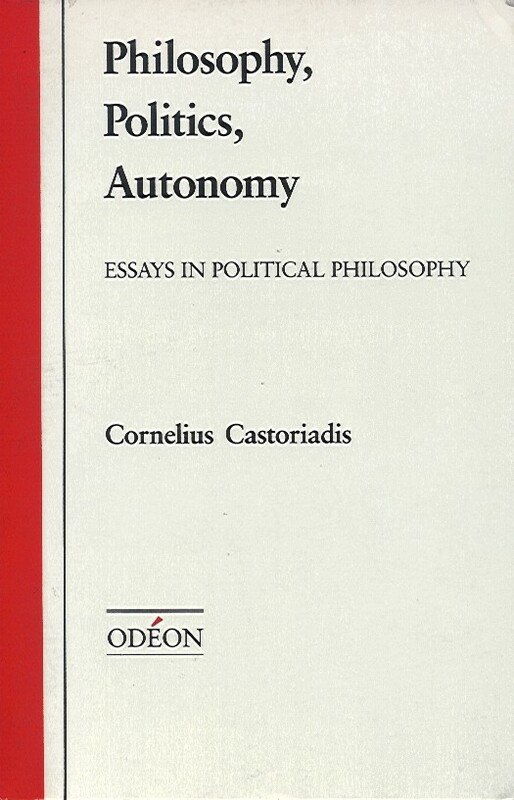 "Comments from critics and coleagues"
It is with profound satisfaction, excitement and anticipation that we present here a collection of the most recent and significant writings of Cornelius Castoriadis on philosophy, politics and autonomy. One searches with the greatest of difficulty to find any contemporary of comparable stature. How one can encourage unfettered dialogue and questioning (an expression of our autonomy) through the imposition from above of a canon and by means of a cultivation of "piety" and "faith" within a hierarchal institutional setting (amidst Gothic buildings) is never explained. All that is lacking for today's neoconservatives is an education Pope, a position to which U.S. Education Secretary William Bennett apparently aspired until he graduated to the more prestigious authoritarian post of "Drug Czar." In other words, for those committed to the project of autonomy the neoconservative position is beneath criticism--though we must recognize its true insight that a society must impart its cultural legacy to its coming generations. We should take issue, however, with the response on the part of many of today's students and point out that the critique of education, begun in the Sixties, had lost its way by the end of the Eighties. It is here in the realm of education that Castoriadis's reflection about autonomy and the simultaneous birth of philosophy and politics in ancient Greece (and rebirth in Western Europe) acquire their highest interest and relevance and offer their greatest challenge to contemporary thought. But to designate a cultural formation does not yet tell us anything about what its significations are or how they are. Except in a trivial sene, the social imaginary significations of a cultural formation, the "magma" of such significations, have no biological (let alone racial) basis, nor can they be created by an individual psyche. An illustration of this point can be found in my Foreword to Castoriadis' Political and Social Writings (see note 1 above), where I mention the role of improvisation in the formation of jazz, a "mulatto" art form (and, by implication, of a "mulatto" American culture, which remains, for the most part, unacknowledged). "Whiteness" and "Blackness" are social imaginary signfications, figures that cannot be unambiguously and univocaly assigned or imputed to specific, designatable, separable individuals in any sort of exhaustive way (even though this is how the terms are most often employed). Such a conclusion is, of course, anathema to racist opponents of "miscegenation" or social "race mixing," just as a similar conclusion concerning "maleness" and "femaleness" would be to a confirmed and self-satisfied misogynist (or misanthropist). In Chapters 3, 4 and 5 of the present volume, Castoriadis explores the inadequacies of common conceptions of "social theory" in coming to terms with the unique domain of the social-historical.